Looking for a build or have one you want to share with the Albion community? The Character Builder is the place to be! 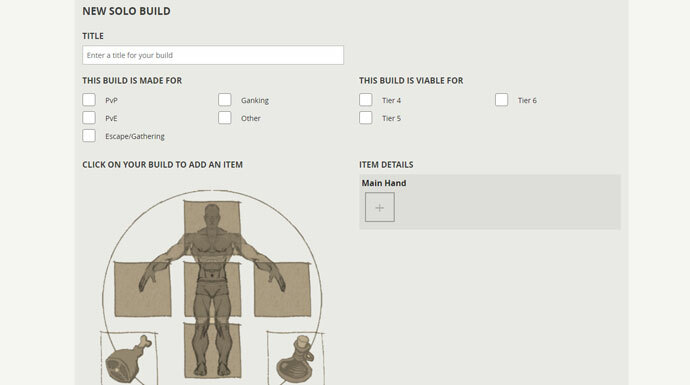 With the launch of Albion Online, we have also launched a brand-new feature on the website: the Albion Online Character Builder. This new tool allows you to not only explore and plan new builds, but to also share these builds with the rest of the Albion community! In the Character Builder you can browse through builds and articles created by players, organized in two lists: “ opular & Featured” and “Recent & Trending”. Looking for something specific? There are several categories you can use to narrow down your search, or you can simply use the search bar to find exactly what you want. In order to create builds and articles Character Builder, you need an account with an active Founder or Starter Pack. However, anyone may browse and read the articles on the site and share them with others through Facebook, Twitter, Google+ and Reddit. You can find the Character Builder on our website under “Tools”, or simply click here! Solo Builds are the backbone of the Character Builder. After all, you are what you wear and your unique combination of weapons and armor pieces is what establishes your role. Create your own Solo Build to showcase your favorite gear set designed for either PvP, PvE, Ganking, Escape/Gathering or Other - for those builds that just refuse to be categorized. Once you've got your build complete, describe the build's design choices and options for customization based on situation or opponent below. You can also use this space to add items, images and even videos of your build in action. With your Build complete, click “ ublish Build” to share it with the Albion community! Whether you are planning for a Guild vs Guild grudge match, your next epic Zerg vs Zerg battle, or roaming the open world with a small group of highwaymen, team composition and build synergy plays a major role in your upcoming glorious victory, or your crushing defeat. 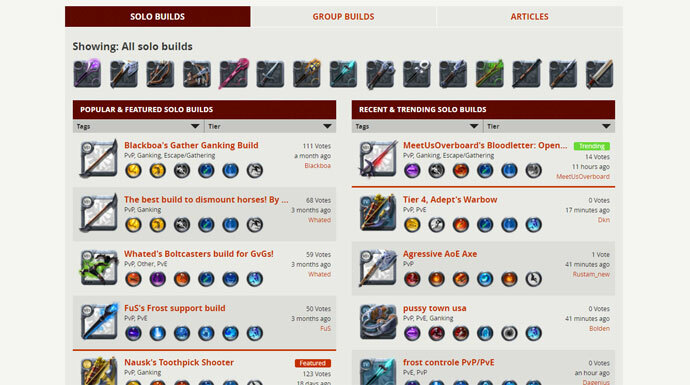 With builds for groups of 3, 5, 10 or 20, the Group Builds allows you to search through published Solo Builds in the Character Builder and add them to your team comp. This gives you the opportunity to look over your entire team's composition, complete with spells, and find any synergy issues or missing roles. Already know the best group composition? 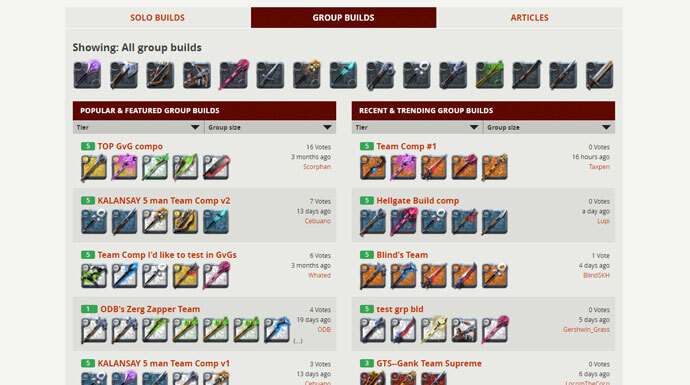 Create a Group Build and share it, perhaps with a description and videos of your team annihilating the competition. 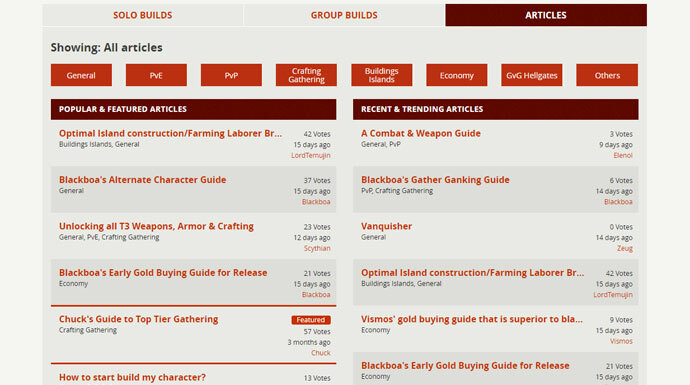 The Character Builder is also a place for you to create or browse articles on any topic in Albion. 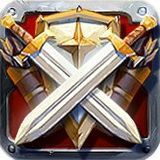 Whether you want to show the most efficient way to plan your farms, the best places to gather, or create a basic guide for new guild members explaining the essentials of the game, the Articles section gives you a place to share your knowledge or gain from the knowledge and experience of others. What do you think of the Character Builder? Have you already published your own builds? Let us know in the comments below or on our forums!